Today’s game against Great Britain had a little bit of everything, but I was really proud of the guys to hang in there for the win. It was uncharacteristic of the guys to play the way they did; they just couldn’t quite make the big shot. I certainly thought we had most of the ends under control, but when the opportunities presented themselves, we kind of let them off the hook a couple of times, and I think the guys would agree with that assessment. In the end, David Murdoch had a shot to win and I think we got extremely fortunate there. But, we had two rocks that picked in the 10th end as if it was hairs from a hair brush. It wasn’t like they just overcurled. They picked almost off the sheet! Great Britain skip David Murdoch checks out his shot with Canada’s Ryan Harnden, top, and E.J. Harnden looking on. So kudos to the guys for making David throw his last shot. Nothing’s a gimme in this game; it was good that they were able to bear down and not give up in that game even though they were frustrated with their own performance. I worked with Brad’s team at the Ford Worlds last year in Victoria, and since then I’ve noticed they’re certainly maturing, growing and developing. 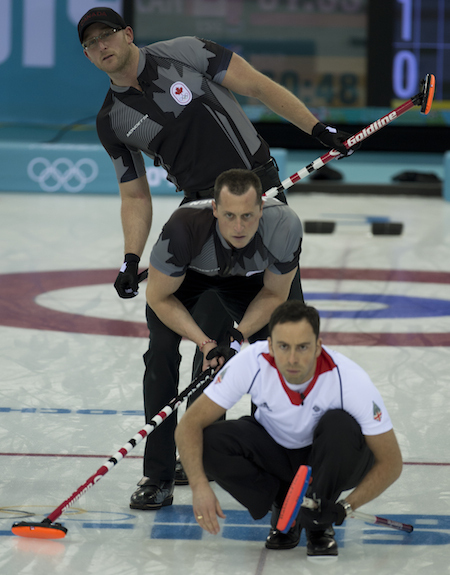 They’re unusual in curling because they play better when they’re amped up and stoked than when they’re not. I know some people criticize them for that, but it’s not fair. That’s what works for them — high energy, staying pumped and maybe even a little bickering. It just keeps them on edge, in the game and fired up and in the game. They’re always walking that line, and some outsiders think it’s maybe too much or that they should perform differently. But I’ve seen teams with all different kinds of personalities. Some are super calm and think that stuff is just a waste of energy. Others need to be totally stoked. 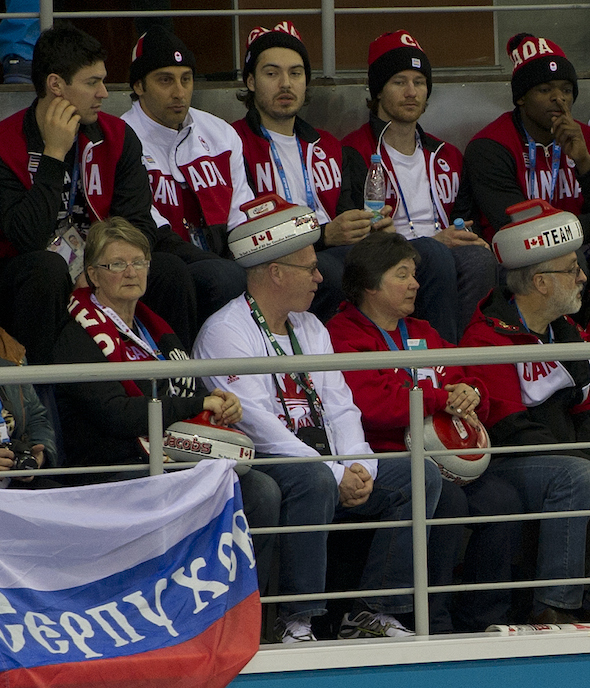 It was very cool at the rink today to look over and see the Canadian men’s hockey team. Tom Coulterman and I actuality had lunch today with their coaching staff. Mike Babcock, Claude Julien and Lindy Ruff. We got to talk a bit, and told them they were glad they were coming to our game because it would inspire the guys. And I probably told them to get Patrick Sharp of Thunder Bay into the lineup! 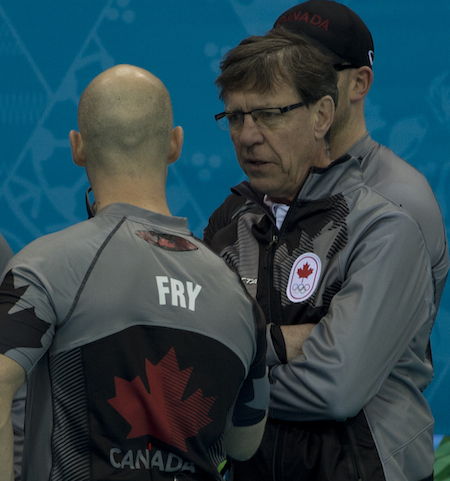 National men’s coach Rick Lang, right, speaks with Ryan Fry. We have tonight off, and then we finish off our round-robin tomorrow against the U.S. and China. The U.S. team has my buddy teammate Al Hackner as their head coach. That’ll be really cool; it’s more fun than anything else. We’re still the best of friends after all these years; we play together at the club and hang out together all the time. We’ve been hanging out here, going out after games and sharing experiences. That’ll be fun being beside him at the coaches’ table. Remember to watch us on TV! Our game against the U.S. starts at midnight Eastern on CBC, and our game against China starts at 10 a.m. Eastern on TSN2.